Former employees fraudulently collecting Unemployment Benefits raises the UI tax rate for all employers in Colorado. 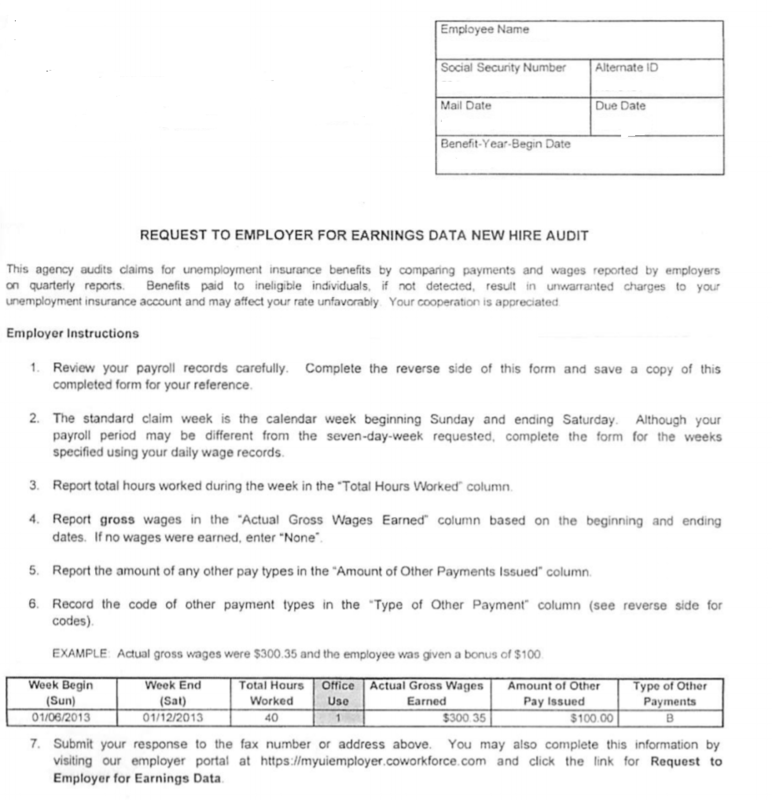 Responding timely to state requests for employee earnings data; like the one below, helps the state determine if an employee accurately reported their weekly earnings to the state while receiving UI Benefits. ASAP will be glad to assist; there may be some questions only you'll be able to answer directly, but we would be happy to gather as much of the pay data on file to help start the process. If you believe a worker is receiving benefits fraudulently; you can report them to the State of Colorado so that a case can be opened to investigate the matter. Often complaints are heard in Colorado ski towns during off-seasons as stories arise of workers collecting benefits while on vacations abroad and thus not available to work. A person is committing fraud if they knowingly make a false statement or withhold information to receive unemployment benefits payments. Not reporting or under-reporting hours and earnings while working and collecting benefits. Failing to report employment. This includes commission, temporary, 1099 (independent contractor), self-employment, or cash jobs. Failing to report a job separation. Fabricating work search efforts or failing to conduct a valid work search. Failing to report refusals of work. Making a false statement or misrepresentation to receive or increase unemployment payments. (e.g., failing to report school attendance while collecting payments). Using another person's identity (name and/or social security number) to work and file for unemployment payments. Helping someone file a fraudulent unemployment claim. Failing to report other types of compensation (e.g., Workers' Compensation benefits, Social Security Disability Insurance). Failing to report being unable and unavailable to work (e.g., ill or injured, out of area, on vacation, etc.) while collecting unemployment payments. They knowingly make a false statement or withhold information to receive unemployment benefits payments. Working while receiving benefit payments may result in a person being charged with theft, which includes a mandatory, monetary penalty of 65% of the total amount overpaid. In addition, a 4-week penalty can be assessed for each week in which the person fraudulently requested payment. Penalty weeks must be served on an active claim for which you are filing for benefits. While serving penalty weeks, benefits will not be paid and no money will be offset toward the overpaid amount. These penalties are in addition to any civil and criminal prosecution, including court costs and/or fines.